Ford has named four winners in the Ford Disaster Relief Mobility Challenge. The four nonprofits will receive specially equipped Ford Transit vans. The Ford Motor Company Fund challenge asked nonprofit organizations how they would customize a Ford Transit van to fit a particular disaster response need in their community. The Ford Disaster Relief winners cover critical disaster-prone areas. 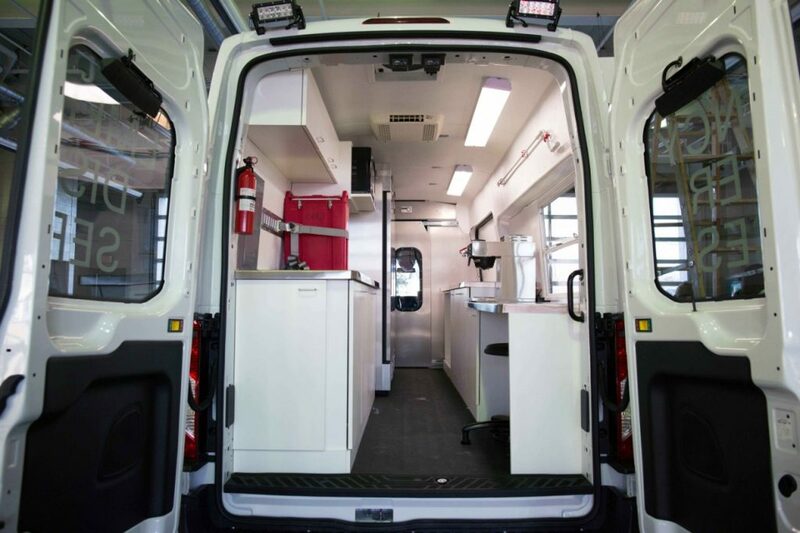 They were selected based on their unique use of the Ford Transit van for disaster relief work, ability to quickly deploy the vehicle across the country, and intended use for the van when not responding to a natural disaster. Empact Northwest, Kingston, Washington – The Transit van will be outfitted with communications equipment, emergency lighting, swift water, flood and other rescue gear; and will allow Empact to transport a rescue boat as needed. When not on disaster duty, the van will be used for first responder training and community education. Mercy Chefs, Portsmouth, Virginia – The Transit van will be used with the organization’s mobile kitchens as a food delivery and distribution vehicle. The van will double the organization’s current capacity and allow them to serve up to 20,000 people a day. With the ability to access hard-to-reach areas, the van will deliver meals from community kitchens when not deployed for disaster relief. Second Harvest Food Bank of Greater New Orleans and Acadiana – By customizing their Transit van with a kitchen, service window and awning, the nonprofit will be able to reheat and serve meals. It will also be equipped with communications tools, such as two-way radios, antenna and a satellite phone with an outside speaker. When not deployed for a disaster, the vehicle will address food insecurity among children and senior citizens. Ford will work with the organizations to ensure the vehicles are ready to respond when natural disasters strike in 2019 and beyond. There are now seven challenge-winning Ford vehicles developed with input from first responders and nonprofit partners. The original three challenge winners were deployed in 2017 to assist disaster relief efforts in the wake of hurricanes and flooding across the southern United States. Over the past five years, Ford has donated more than 50 emergency response vehicles and, with the Ford Fund, contributed more than $5 million to aid response and recovery in the U.S. and abroad. Ford Transit sales are expected to be over 130,000 units in 2018.